I am not ruined. ﻿I am ruination. YES! I loved it. 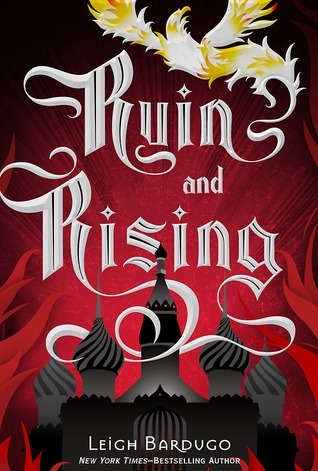 Ruin and Rising by Leigh Bardugo gave me all the things I wanted from it. There was just one small thing I was not happy with, but okay, whatever! I gave Ruin and RIsing five out of five stars. I loved it! Leigh Bardugo finished of a great series with one big explosion. But she also gave me the idea that she is too scared of letting go of her darlings. She sacrifices Mal for this big explosion, but then after the explosion has happened and things are subsiding, he is all of a sudden alive again! I got so annoyed with this fact, but soon got to let go of my annoyance. I loved the end even though the two people I would not have shipped together. It is just so well written! Most of the time I could forget the things that bothered me. Nicolai is awesome as ever and seems to end up to be a great ruler. Alina is changed by the events of Seige and Storm and this influences her a lot during Ruin and Rising. She basically has to start over learning how to access her powers. I like her growth here. She later also gets over her obsession with the third amplifier. She also figures out how to (mis)use her connection with the Darkling, I love to hate that guy! I enjoyed reading this series. I like a story that is set in a completely different world from ours, which makes me wonder on why I never picked up these books. How stupid am I? This entry was posted in Book Review and tagged Adventure, Book Review, Drama, Fantasy, Leigh Bardugo, Romance. Bookmark the permalink.